With Guilermo Del Toro attached as a producer, you can expect the quality to be high (like The Orphanage). 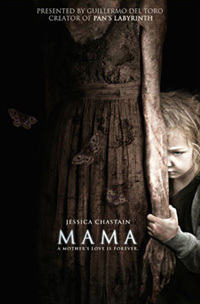 But, while Mama features a very emotional mood and some tense, creepy moments and good scares, I feel that the digitally enhanced villain (while very well executed) lacked a sense of realism within the physical world she infiltrates. An actor in prosthetic make-up FX shot underwater would've worked better. But that's just me – a post 2000 audience have integrated themselves into the digital prerequisites in all movie genres and may not find it distracting. Another sore point (that seems to be the theatre's neglect) was a washed-out image that had dark scenes badly contrasted with things hiding in the shadows not being visible and losing detail. While effective in blending psychological issues and ghostly terror, Mama is unfortunately not in the league of a movie like the aforementioned Orphanage.